The Mooncake location that I frequent is the one in Hell’s Kitchen at 359 West 54th close to 9th ave in Midtown. They definitely deliver, but I suggest going to the restaurant as I have personally found that portions are larger there and that the delivery size of the meals is not as consistent. The place is small though; so go at strategic times, or beware that there may be a wait, but not a long wait as they have a quick turn around normally. There are a few things here that I love. The first is steak and roasted peppers hero with garlic dill mayo. The sandwich is made with delicious sliced hanger steak and is served on a fresh, crunchy baguette. It comes with a mini salad on the side. Dunk this baby in lots of green sauce. My 2nd favorite sandwich here is the Vietnamese Pork Meatball hero. It is served on a fresh crunchy baguette as well, but it is topped with chili sauce, cilantro and pickled carrots and daikon. Also served with mini salad on the side, and also def dunk in lots of green sauce. My usual go to meal here though is the lemongrass shrimp and rice noodle salad. This is a meal you have to have in the restaurant, it is so much larger there than if you get it for delivery or take out. 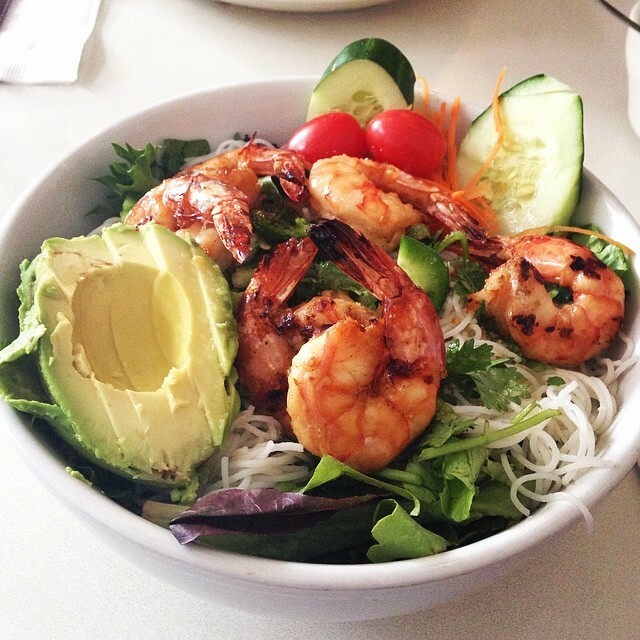 Mesclun greens are topped with cherry tomatoes, carrots, cucumbers, Thai basil, cilantro, jalapeños, rice noodles, oil free Vietnamese, ginger, chili, fish sauce dressing and then topped with lemongrass marinated shrimp, which are grilled to perfection. I like to add an avocado, although it it pretty pricey for just half an avocado, IMO. Green sauce, obvi. My one call out is I wish that the shrimp came chopped up and with out the tails on. That is just my personal preference though. I always ask for a small plate to chop them up myself on and to remove the tails.